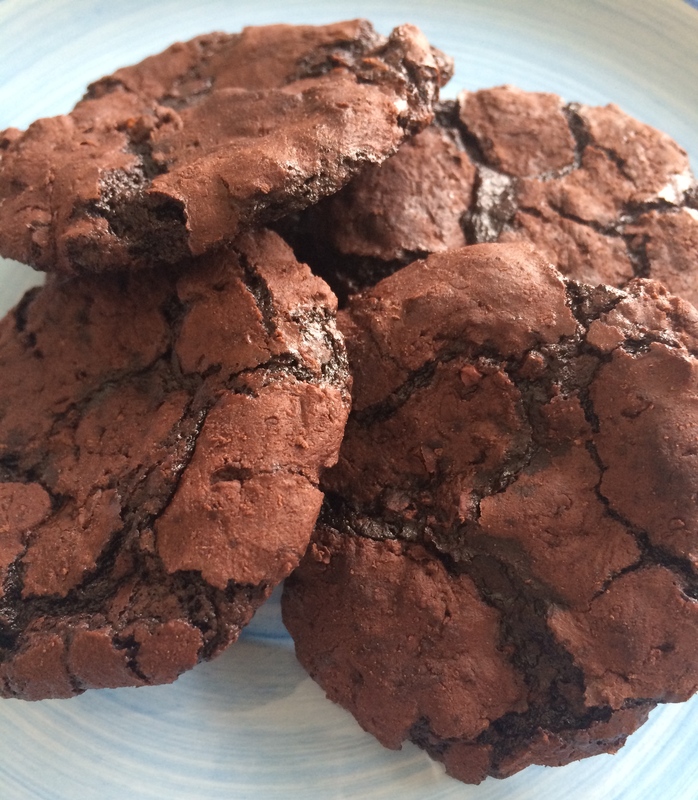 Triple chocolatey, ooey-gooey, decadent and gluten free! This is my first trip into the world of gluten free baking. I gravitated toward this recipe because I was intrigued that there’s actually no flour products of any kind. This recipe can be mixed by hand or with a standing mixer. Give it a try! Place oven racks in lower and upper thirds of oven; preheat to 350 degrees. Whisk powdered sugar, cocoa powder and salt in a large bowl, then whisk in egg whites and egg; fold in chopped chocolate and cacao nibs. If the batter seems too dry, add another egg white. Spoon batter by the tablespoonful onto 2 parchment-lined baking sheets, spacing 2 inches apart. This is a great recipe to use non-stick silicone baking sheets (Silpat). Bake, rotating sheets once (after 5-6 minutes), until cookies are puffed, cracked and set just around the edges, 14-16 minutes. They will look a bit underdone. Transfer baking sheets to wire racks and let cookies cool on pan. They’ll firm up when they cool. Cookies can be baked 3 days ahead and stored in and airtight at room temperature. **If you have a serious allergy to gluten, the markets sell gluten-free powdered sugar. There is no gluten in powdered sugar, but it is often a cross contamination issue or the manufacture’s choice of starch has a gluten product in it. Mmm these look soo good, love the crinklyness! Looks outrageously delicious! Can’t wait to try! They look marvelous, I’ll take a dozen! They are as good as they look. I was lucky enough to receive some and they are awesome.